Eeek, the lighting is hard to photograph, I promise the rug matches the walls and the wall color is an awesome vintage green (Behr Aquatone). The window shade is a badly cobbled-together mistreatment. I didn't take detailed pics of the process, but it amounts to some (impossible to iron) natural cotton duck fabric, aqua ribbon, stitch witchery, and many pins and stiches. Unfortunately, it is still wrinkled and the folds are crooked, but I'm no Centsational Girl, so I had to make peace with my mediocrity. Dig? I found the monogram candles on clearance at Pottery Barn. All they had left was vowels, so now Shaun gets to make jokes about what I owe him every morning. What a scream. My last lilies from the yard are in a Crate and Barrel vase, along with my beloved Fresh Lemon candle from Bath and Body Works, why can't they have it all year? Someday, I will have a granite counter in here and a mirror that isn't held on with plastic clips, but for now it works. 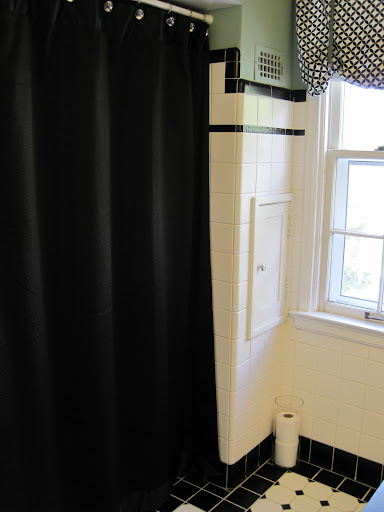 For more on the bathroom's hidden secrets, click here. Fun touches! I love the pin-up girls above the commode. So fun. I'm totally digging the shower curtain. It's fun to mix things up every once in a while. Great finds!! I love mini-makeovers! That is a big change for just changing the details and I love the way it looks. And I am right there with you on the countertop thing. The shell shaped sinks are past their prime. O cute! It gave the space a whole knew look! I love those vintage prints with the colors! You did a great job! LOVE your floor, tile, towel rack - ALL of it. Whatever you put with it will always look great!! Your bathroom is looking great! Also, I love how you're waving in the mirror on that last picture. Too funny! Love the wave in the last pic. I've been tinkering with the idea of doing a shade a la Centsational Girl. I will now avoid cotton duck. Thank you. Looks great! I just refreshed mine with a quart of paint and shower curtain too. Awesome job, Sara, I LOVE the colors! Pop over to Rehab when you get a chance; I just gave you an award! That wave is the funniest thing. And I, for one, am impressed by your roman shade. I would botch that project up so badly I won't even try it. You have "mad skillz", as people cooler than me would say (or maybe that phrase is already old so they wouldn't say it, whatever). I like it A LOT, lol! LOVE IT!!!!! I really love your Roman window treatment. Hahha, duck fabric stinks no? No idea how people sew slipcovers with that stuff. I bought a whole bunch and it's balled up deep in the closet. The bathroom looks very fun. Reminds me of a cute motel we stay in NY. Very retro. Very 50's like. I adore your new shower curtain - very classic. 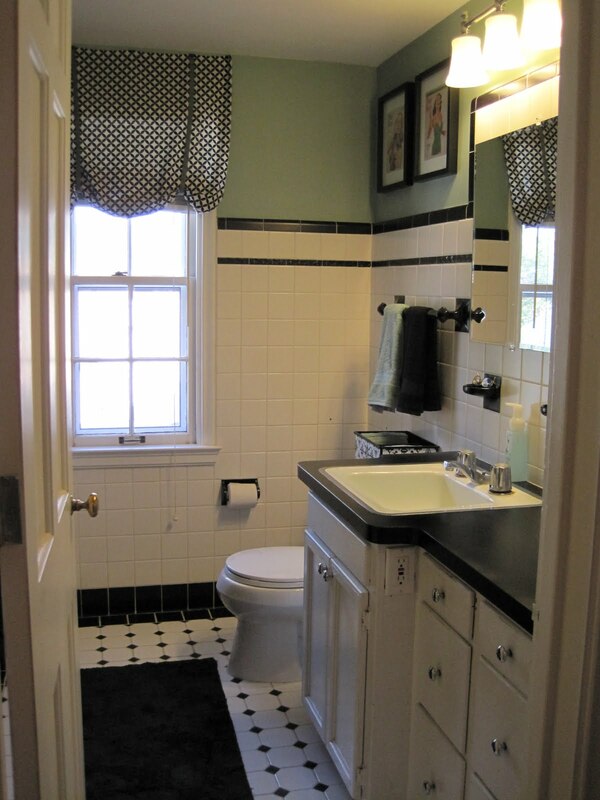 And, your bathroom as a whole is just gorgeous. Great work. I don't think it's too summery to transition into fall.